Welcome to the Girardian Virtual Bible Study! Each week we explore the lectionary passage with the help of René Girard’s insights into human relationships. We hope you enjoy this installment of the GVBS. Join us next week at 10:30 am Central on the Raven Foundation Facebook page for the live show. The show notes and video recording are below. This week’s episode explores Palm Sunday, Year C, Psalm 118:1-2 and 19-29 and Luke 19:28-40. Truth to power! Defiance! Revolution! And… humility? There are layers of subversion in both of our readings, starting with the psalm. The refrains of Psalm 118 are so often woven into the church liturgy that they hardly seem subversive; we recite them all the time. They have a lofty, ceremonial tone and are often used for coronations and official events, as if to sanction the power structure and those whom it upholds. Yet this is also the psalm of the Passover, of escape from slavery. It is a psalm of liberation from oppression. It celebrates God’s empowerment of people who were once exploited and dehumanized. It praises the complete upending of power structures that enrich a dominant ruler or class at the expense of the exploited and marginalized. It cannot be emphasized enough how subversive this is in a world in which the strong so often conquer and crush the weak. Thousands of years later, we still live in a world in which the majority of people have “their backs against the walls” as the great theologian-prophet Howard Thurman has said. The wealth gap between the rich and the poor continues to grow. Wars devastate the world and impoverish millions, with exorbitant profits finding their way to the pockets of some political and business leaders. And the concentration of so much power and wealth in the hands of an elite few depends upon scapegoating, excluding, and turning people against one another. And this can only happen when we are convinced that some groups, some lives, don’t matter… maybe even our own. The ways of fearmongering and blame and division still operate so heavily in the world that the truth that God loves everyone, and especially that God loves the weak and the marginalized, is always radically, politically subversive. It was subversive in Egypt thousands of years ago, when God liberated thousands of dispossessed slaves who had been brought into Egypt through conquest and forged them into a nation. And it remains subversive today when structures of racism, classism, homophobia and bigotry depend on the lie that some are outside the realm of God’s love. If people’s oppression depends on the deception and self-deception that their lives are worthless, then the truth of God’s steadfast love for those society would marginalize and exclude is subversive indeed. “Open for me the gates of righteousness, that I may enter through them and give thanks to the Lord.” The gates that were once closed are flung wide open, and those once deemed unworthy pour through them. Before this referred to the Crucified One, it referred to David, the smallest and weakest of Jesse’s sons who defeated Goliath and became king. For those who are oppressed, to know that God loves them subverts the world order. But a belief that God liberates through violence simply reinforces an order of violence. Scripture certainly has its share of violence. It also has a trajectory of showing us that violence once attributed to God is actually human in nature, and that God’s liberation is not through but from violence. For those who are oppressed, to know that God loves them is to subvert the world order. The parts of the psalm not covered in the lectionary declare victory over enemy nations. This may be taken to mean that God has conquered the psalmists enemies, or it may mean that God has dissolved the spirit of enmity that bound the psalmist and the nations in war. Israel’s history is subversive, but an interpretation that God shows love through defeating enemies is not subversive enough. After all, people of various faiths who have followed a violent interpretation of God – or an interpretation of God’s love that encompasses only some but not all – have, in the name of righteousness and justice, inflicted injustice upon others. The Jewish prophets showed the world the true, nonviolent love of God by broadening the circle of God’s inclusion, by mandating compassion to the immigrant and alien, by declaring that even those once considered unclean belong, by foretelling the beating of swords into plowshares. And yet there were zealots in Jesus’s day who anticipated the Messiah as a warrior-liberator from Rome. Is that what the people thought they were getting on Palm Sunday? The crowds of Jesus’ time could not have missed this symbolism. 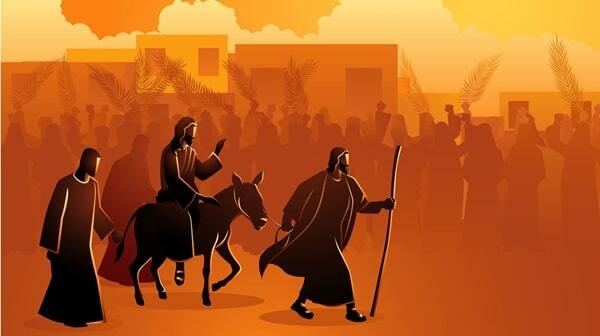 But, living under the harsh boot of Roman oppression, and moreover living in a world where power structures have only ever seemed to change through violent uprising or conquest, I’m sure many of them did not grasp what Jesus was really all about when he rode into the city. 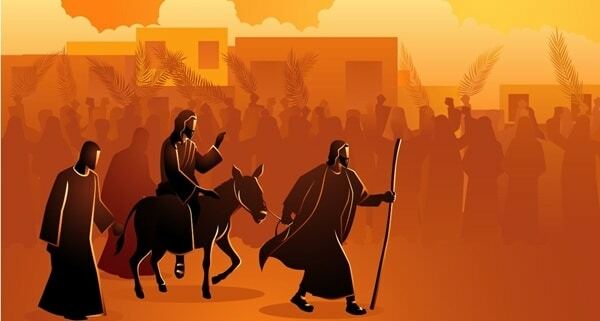 Clearly, the people sensed that their liberation was at hand as they went out to meet Jesus this day. When the gates of righteousness opened to him, they saw themselves with him. As I and others have pondered before, within these crowds may have been people Jesus healed, fed, taught, embraced… people he has restored to the community from the margins. People once considered unworthy suddenly know that they are loved and that they matter. They are brought into the fold of a community renewed by their presence, by their inclusion. As they honor Jesus, they see themselves with him because he has brought a sense of dignity and value to their self-identity. This feeling so stirred their souls that they spread the news of Jesus’s imminent arrival in an age before phones or social media or even widespread literacy, by word of mouth. And multitudes show up, swept up in the power of the moment. Something is going to happen, and those who were once outcasts will play a pivotal role. The stone that the builders rejected has become the chief cornerstone. The people were ready… for what? Some may have anticipated battle. Some probably did not know what to expect. But change was coming. Those whose authority depended on their loyalty to Rome and ability to keep the peace felt the change in the air as well. Some of the Pharisees are getting nervous. It is not hard to see why. The crowds are hailing a new king who is neither Herod (the puppet-ruler loyal to Rome) or Caesar. There can only be one ultimate power, and that’s the power of Rome. Rome rules with a heavy hand, where the people are never truly safe, but they are permitted to live if they live in submission. This is insubordination. Heads are about to roll. Blood is about to flow. Nothing can be done to stop the liberation of the people. Israel’s history is playing out once again, subverting the powers of oppression. Passover is drawing near, and the people sense that they are about to be set free. But Jesus is not leading troops into battle, and he will not strike Rome with a sword. The Egyptian soldiers may have drowned in the sea, but Jesus is not about to take on the Roman army. He knows as well as the Pharisees that this situation is unsustainable and that blood will soon flow. But he also knows that the blood will be his own. He is riding to die. And I don’t think the people get this yet. But it will soon become clear. Jesus knows that blood will soon flow. But he also knows that it will be his own. Can you imagine the disappointment when Jesus is arrested? Can you imagine crushed shards of hope cutting like knives? Can you imagine the fear? Those who counted on Jesus to assure their victory become aware of his imminent defeat. He will die a criminal’s death. Those who supported him, likewise, will be indicted. Their lives will be in jeopardy… unless they can prove that they were never with him. Anger will overwhelm some, and spread like a contagion. This man upon whom they thrust their hopes will be the death of them all… unless he is killed. The “Hosanna”s turn to “Crucify”s. The crowd’s king becomes their scapegoat. There really isn’t anything particularly subversive about crucifying kings, though, incredible as it may sound. Hope thwarted becomes disappointment and blame, and when it is all thrust upon one person or group, it becomes a cross that will break the back of its bearer. Humanity has killed its kings as scapegoats from the beginning of time. Jesus knows this. He stood in solidarity with the poor and the outcast, but he also stood in solidarity with the leaders who bore the weight of the wrath of the people. Both are scapegoats, for both show communities that outsource their grievances onto others. This has been humanity’s way from the foundation of the world — blame and scapegoating, division and enmity. There’s nothing particularly subversive about crucifying kings. Humanity has been doing it since the foundation of the world. What is subversive is that Jesus will go to his death willingly. He will draw the wrath of Rome and all the world onto himself; he will knowingly bring the world together over and against him. He will do so by riding in as king and drawing first accolades and then accusation. But even in his royal processional, he will show a new style of kingship. He rides a beast of burden, not a war horse, to show that leadership from now on will be rooted in service. He will then go on to die… and rise again with forgiveness and healing in his wings. He will render death and all its power impotent, thus freeing the people — Jew and Gentile and even Roman alike — from much more than one empire. He will free the people from the ways of death and fear and exploitation and greed and scapegoating. He will open a new life rooted in cooperation and connection. For now, though, he rides. The people cheer. They think they are ready. They have no idea. An ominous feeling in the air is drowned out by “Hosanna”s. Joy will soon turn to jeers, but for now, the festive pageantry carries on. Image: Stock Vector from 123rf.com.